Dr. Haddon taught me this figure in August, 1904. He obtained it in Murray Island, Torres Straits, where it is called Tup = a small Fish (Rivers and Haddon, p. 152). 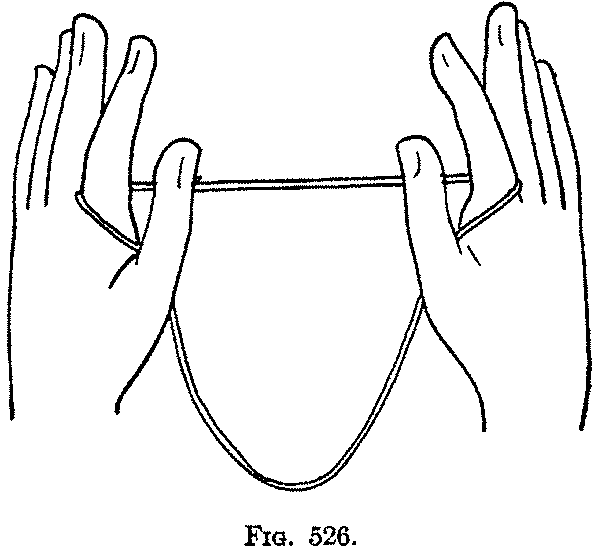 First: Insert the index fingers into the loop of string so that you have a short piece passing from hand to hand as a far index string and a long loop, the near index string, hanging down between each thumb and index (Fig. 526). Hold the short far index string on each side between the tips of the thumb and index, and form in it a small upright ring by carrying the part of the string held by the left hand toward you, and to the right, over the right hand string. Put the index fingers away from you into this ring (Fig. 527) and separate the hands. You now have two loops on each index, whereof the two far strings cross each other, but the two near strings run straight from index to index (Fig. 528). Second: Bend each thumb away from you over the lower near index string, and pick up on the back of the thumb the lower far index string, then straighten each thumb, bend it over the upper near index string, and pick up on the back of the thumb the upper far index string (Fig. 529), and return the thumb to its original position. 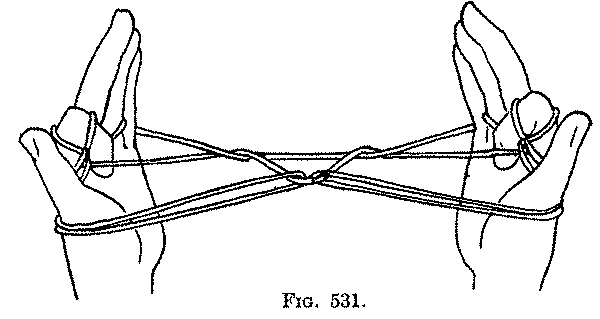 Third: Turning the palms toward you, bend each little finger toward you over the upper near index string, and take up from below the lower near index string (Fig. 530, Left hand), and return the little finger to its former position (Fig. 530, Right hand). Fourth: Bend each index down into the large triangle formed by the upper near index string and the lower near index string (the string passing from the index behind the little finger and continuing as the far little finger string), and pick up on the back of the index (Fig. 531), by curving it toward you and then upward, the upper near index string. Fifth: Turning the palms away from you, release the loops from the thumbs, and the figure is extended between the tips of the index fingers and the little fingers (Fig. 532). 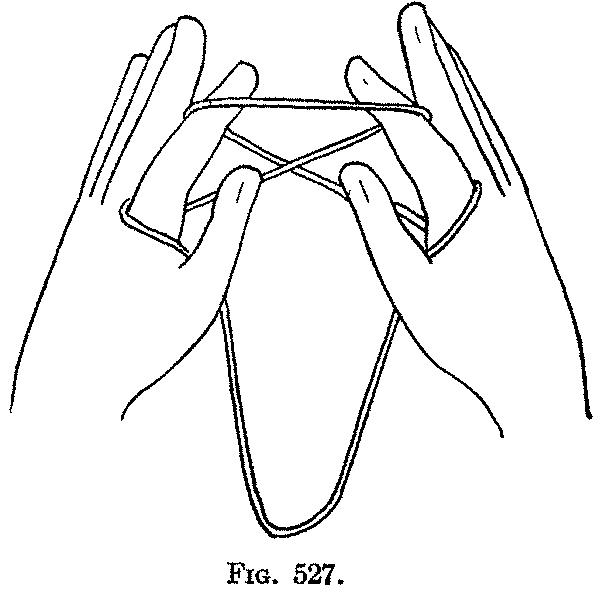 The string held by the little fingers may be drawn tight by closing the middle, ring and little fingers over it. Dr. Haddon says there are four fishes-the four double strings arranged like a W.
The opening movement of this figure is different from any we have had so far, and it occurs again only in the following "Storm Clouds" of the Navaho Indians. 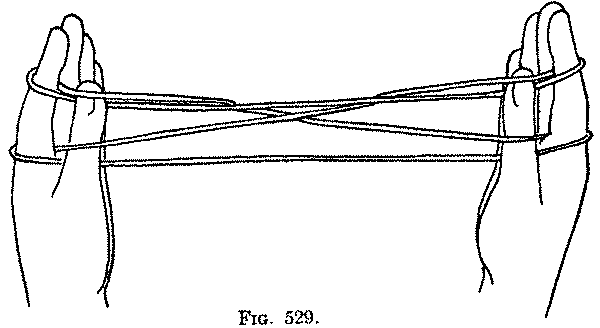 In the two Bagobo Diamond figures (also Bagobo Two Diamonds), after Opening A, the two loops become arranged on the index finger, but not in the same manner as in "Little Fishes," for in the "Bagobo Diamonds" the upper straight string is a near index string and the lower straight string is a far index string; and in the "Bagobo Two Diamonds" it is just the reverse, the upper straight string being a far index string and the lower a near index string. In "Little Fishes" both straight strings are near index strings. You cannot, therefore, make the Bagobo Diamonds from this opening, nor can you form this figure by beginning as you begin the Bagobo figures.